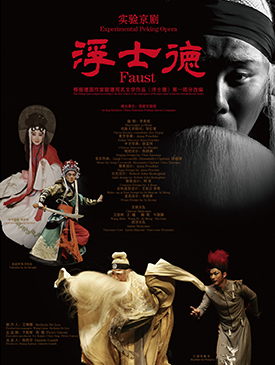 A Peking Opera performance based on Goethe's masterpiece "Faust" tale has been staged in Beijing. The play, co-produced by the China National Peking Opera Company and the Italian Emilia Romagna Theatre Foundation, was performed at the Mei Lanfang Theater on Saturday and Sunday. As an experiment to render Western classics with Chinese art, the play was created by artists from China, Italy and Germany, including Chinese playwright Li Meini, German director Anna Peschke, Chinese director Xu Mengke, Italian composers Luigi Ceccarelli, Alessandro Cipriani and Chinese composer Chen Xiaoman. Previously, the opera was performed in Bologna and Modena, Italy, during the VIE Festival 2015 and Tsinghua University in Beijing last year. It was also shown in New York in January this year. The performance at the Mei Lanfang Theater was staged after revisions were made in dancing, lighting and play book.